The Payment Card Industry Data Security Standard (PCI-DSS) is an information security standard for organisations that handle branded credit cards from the major card schemes. Unfortunately data breaches occur regularly and e-commerce sites are a very frequent target from hackers who often successfully compromise e-commerce sites. Being compliant with PCI-DSS means that you are doing your very best to keep your customers valuable information safe and secure and out of the hands of people who could use that data in a fraudulent way. The Payment Card Industry (PCI) Data Security Standard (DSS) was developed to encourage, enhance and facilitate the broad adoption of consistent data security measures for cardholder data globally. The PCI-DSS increases the controls around cardholder data to reduce credit card fraud. Effective compliance process with a solution tailored to your needs. 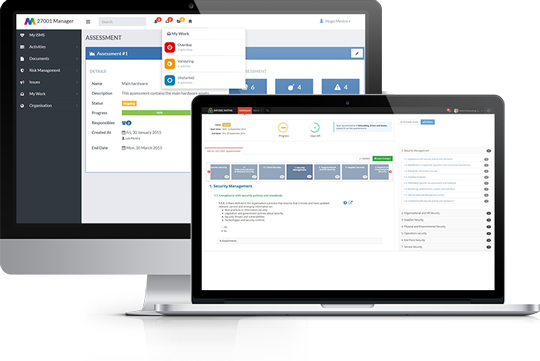 IntegrityGRC is a continuous compliance solution that provides year-round compliance program support, helps you maintain your compliance posture, and addresses gaps in your resources. In addition, IntegrityGRC provides organisations with documentation and reporting tools to support your PCI-DSS compliance needs. The IntegrityGRC platform contains advanced features that make managing your risk and compliance program much easier. IntegrityGRC ensures that all necessary steps are taken and enforces control processes and verification of information. Tracking and monitoring processes and approval checkpoints ensure that steps and information are not overlooked, missing or incorrect. The ongoing management, review and implementation process ensures that document workflow processes adapt and track changes across the organisation. As compliance issues are discovered, built-in workflows allow the right person to be notified with a detailed view of the issue to be addressed and corrected. Manage all the documents associated with PCI-DSS policy and procedure management process. Documents can be uploaded directly into the solution, which captures version control and maintains an audit trail of all changes for quick reference and past reference. IntegrityGRC helps you delegate resources and time more effectively and identify your most critical policies and procedures through scoring and assessments, leveraging our best practice criteria or inputting your own methodology. IntegrityGRC is a solution that continuously monitors the PCI posture, and organises and presents visualizations to help your organisation identify and address PCI compliance gaps while providing evidence of activities, decisions and actions, and support Root Cause Analysis through a structured approach to capture and analyse data. Get the details of PCI-DSS in a comprehensive report complete with summaries, details, and visuals. Identify vulnerable or non–compliant controls and use flexible filtering and formatting options to run a report on any control or group of controls by owner, process or criticality. Why you should get compliant?